An insurance claims adjuster investigates problems affecting a number of robots integral to the operation of their dystopian society. Solar storms decimate a near-future Earth, killing 98% of the world's human population and leaving what remains to save themselves with robots designed to produce an artificial replacement for the destroyed ozone layer. 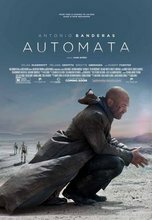 Automata follows Jacq Vaucan, claims adjuster for the conglomerate responsible for the robots' creation, as he unravels a disquieting conspiracy involving corporate deceit and self-aware robots when he is asked to investigate reports of robots breaking their ostensibly strictly-defined rules of conduct.